All Geeks Rejoice: Decklist Ex Machina #10 Breaking News! Coming up with fun Magic the Gathering decklists on a budget so you don't have to. Breaking news! This storm is causing pandemonium! The deck itself doesn’t require Pandemonium to win by any means as it’s a very capable Elemental deck on its own but Pandemonium turns this deck into a typhoon. 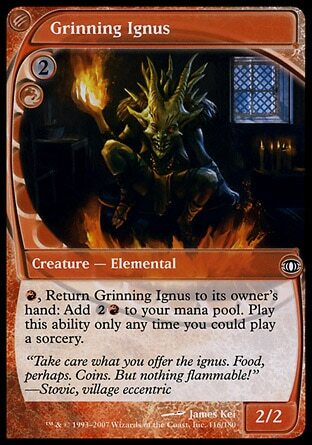 Primal Forcemage and Grinning Ignus both combo with Pandemonium and provide some interesting interactions that simply can’t be ignored. The Forcemage turns all of your creatures into tactical nukes and the Ignus turns itself into a gatling gun. 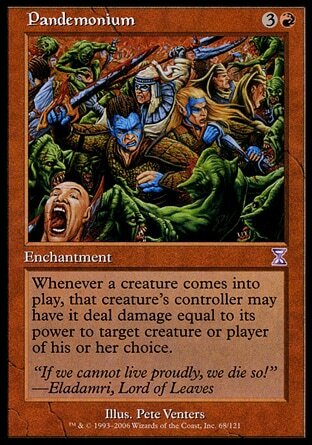 Imagine this scenario: A Pandemonium in play and Forcemage is on the field. You cast Ball Lightning and Pandemonium deals 9 damage before you even swing into your opponent. If your opponent chump blocks then you've most likely destroyed their entire field. Otherwise, you’ve managed to get another 9 damage in for only 3 mana. Then you Fling the Ball Lightning into their face! That’s 27 damage and the game’s already over. Flamekin Harbinger can search for Nova Chaser to then be championed by the Chaser itself. If the Nova Chaser dies at any point (like a handy Fling...) then Harbinger enters play again and you get to search for yet another elemental (or more specifically: another Nova Chaser if you're into that sort of thing). Spectral Force may seem like a strange choice but it only needs one swing to be devastating which is a bargain for how cheap its converted mana cost is. I kept comparing Ball Lightning siblings such as Groundbreaker and Force of Savagery but they just weren't as efficient in this particular deck. 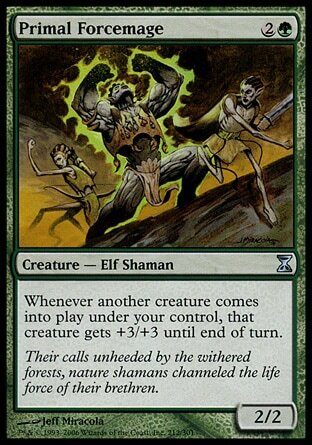 As for the rest: I'm pretty sure Incandescent Soulstoke, Smokebraider, and Sakura-Tribe Elder are self explanatory. This is Kylak signing out because this news really will break you.